The All Liberian Music Festival will be organised by entertainment company Uprok Events. 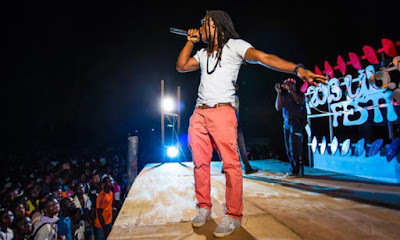 The company's CEO T Mark Korpu said the event would take place at the Antoinette Tubman Stadium in Monrovia on 14 March. It would feature performances from several A-list artists and bring together producers and record label scouts in search of new artists. "The festival is predicated upon the need to sow neatly and tightly the loose intra-cultural relationship in Liberia by using music as a potent weapon of intercultural understanding, and medium of appreciation for the country’s arts and culture," Korpu said. He said being the first of its kind in Liberia, the festival was also aimed at promoting unity among Liberian music industry players – something which had been lacking over the years. "We will also like to announce that certain percentage of the total revenue generated will go to a development project to aid the industry, and this will be an entertainment arena that will host not least than 8 000 people." Korpu said the event was aligned to President George Weah's first of four pillars of governance: power to the people. During his first official speech to Liberians in January 2018, Weah said: "We shall focus on reviews and revision of our education system, improve health and sanitation, promote and strengthen gender equality, and provide for youth reorientation and empowerment through training of all kinds, the creation of jobs and the expansion of sports." Korpu called on the government, business owners, small and large enterprises and influential individuals to join his company’s efforts to make the festival a success. On social media, Korpu has put up a call for suggestions from the public. "We are creating our line-up of the first ever All Liberian MusicFest 2019," he wrote. "So far we need your help. Who are the hottest artists right now – local or international from Nimba County? Mention their song/songs and tag the artist."